By now many of us are familiar with the National Institute of Mental Health (NIMH) 2009 launch of a new initiative called the Research Domain Criteria (RDoC) project. RDoC continues to be a work-in-progress with the primary goal of developing a classification system for mental health disorders that is dimensional and that links to neurobiological systems. The proposed framework is distinct from our current classification systems (i.e., DSM, ICD) in a number of important ways. Although, practical application of RDoC for diagnosis and treatment in real-world clinical settings is far off, it will help us to begin to reformulate the way mental health problems are classified and diagnosed. This is in line with the growing emphasis on precision medicine, whereby diagnosis is defined, at least in part, by the underlying cause of dysfunction and treatment is therefore highly targeted. Thus, RDoC would be informed by and would convey mechanisms of pathology insomuch as we can build this knowledge base. Specifically, RDoC aims to (1) integrate multiple scientific disciplines in a translational manner to identify “fundamental behavioral components” that may play a role in a number of mental health disorders and that can be linked to neurobiological circuitry, (2) delineate dimensions of these fundamental behavioral components that range from normal to abnormal, (3) establish standardized, reliable, and valid measures of these components in order to facilitate continuity across research studies, and (4) to start to put together the underlying “genetic, neurobiological, behavioral, environmental, and experiential components” that make up these disorders (Cuthbert & Insel, 2013). Five central domains of functioning were laid out by the RDoC workgroup with the help of key experts in clinical and basic science. Experts focusing on each of these domains then sought to agree on domain-specific dimensional constructs, with the intent that they remain subject to continued research and revision. For example, the Negative Valence Systems domain is currently comprised of Acute Threat or Fear, Potential Threat or Anxiety, Sustained Threat, Loss, and Non-Reward. Each of these constructs is further broken down into various units of analysis that include genes, molecules, cells, circuits, physiology, behavior, self-reports, and paradigms. A matrix of these domains, constructs, and units of analysis are available on the NIMH website. You will notice that some constructs have more content than others and this is because much of this research is in early stages. Thus, a new wave of clinical translational research is needed to expand on this work and fill the gaps. RDoC contrasts sharply with our current classification systems, which define mental health disorders based on clusters of symptoms as opposed to constructs derived from neurobiological mechanisms. In addition, RDoC aspires to flesh out normal to abnormal dimensions of these so-called fundamental behavioral components, which then can overlap and interact to constitute, perhaps, new clusters of symptomatology. As pointed out by Cuthbert and Insel (2013), taking a dimensional approach also allows for non-linear patterns to emerge (e.g., U-shaped curve). One obvious challenge will be to design valid measures capable of capturing the full range of these dimensions and sensitive to transitional junctions along these dimensions associated with impaired functioning. As clinicians and clinical researchers, what is your take on the RDoC movement? What are implications for the mental health problems you focus on for treatment and/or research? What is your vision for the future of diagnosis? What problems do you foresee? Comment here or on our social media sites (Facebook, Twitter, LinkedIn). Alexopoulos, G. S., & Arean, P. (2013). A model for streamlining psychotherapy in the RDoC era: the example of ‘Engage’. Molecular psychiatry. Carpenter, W. T. (2013). RDoC and DSM-5: What’s the Fuss?. Schizophrenia bulletin, 39(5), 945-946. Casey, B. J., Craddock, N., Cuthbert, B. N., Hyman, S. E., Lee, F. S., & Ressler, K. J. (2013). DSM-5 and RDoC: progress in psychiatry research?. Nature Reviews Neuroscience, 14(11), 810-814. Casey, B. J., Oliveri, M. E., & Insel, T. A Neurodevelopmental Perspective on The Research Domain Criteria (RDoC) Framework. Biological Psychiatry. Cuthbert, B. N. (2014). The RDoC framework: facilitating transition from ICD/DSM to dimensional approaches that integrate neuroscience and psychopathology. World Psychiatry, 13(1), 28-35. Cuthbert, B. N., & Insel, T. R. (2013). Toward the future of psychiatric diagnosis: the seven pillars of RDoC. BMC medicine, 11(1), 126. Franklin, J. C., Jamieson, J. P., Glenn, C. R., & Nock, M. K. (2014). How Developmental Psychopathology Theory and Research Can Inform the Research Domain Criteria (RDoC) Project. Journal of Clinical Child & Adolescent Psychology, (ahead-of-print), 1-11. Insel, T., Cuthbert, B., Garvey, M., Heinssen, R., Pine, D. S., Quinn, K., … & Wang, P. (2010). Research domain criteria (RDoC): toward a new classification framework for research on mental disorders. American Journal of Psychiatry, 167(7), 748-751. Simmons, J. M., & Quinn, K. J. (2014). The NIMH Research Domain Criteria (RDoC) Project: implications for genetics research. Mammalian Genome, 1-9. Simpson, H. B. (2012). 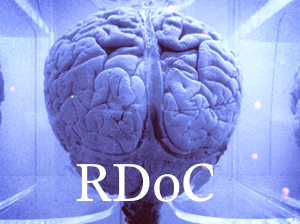 The RDoC project: a new paradigm for investigating the pathophysiology of anxiety. Depression and anxiety, 29(4), 251-252. Young, G. (2014). PTSD, Endophenotypes, the RDoC, and the DSM-5. Psychological Injury and Law, 7(1), 75-91.